Residential window tinting in Denton, TX helps in blocking out that midday sun while making your home more beautiful and comfortable. FlexShield offers a range of high-quality films that let you enjoy the view from your window while protecting your home's interior from harmful UV rays. It's amazing what a thin layer of film can do for your home. Contact us, today, to request a free estimate on home window tinting, auto window tinting, or commercial window tinting in Denton. You'll be surprised at how affordable it can be. Window films offer a great alternative to solar screens. With a wide variety of styles and hues to choose from, you'll be able to filter the light entering your home and create the exact look you want. Whether you want a bold design or a subtle, natural look, we have you covered. Over time, the sun takes its toll on fabrics, furniture, rugs, and art. Our film blocks out up to 99% of ultraviolet light and keeps your valuable furnishings looking like new. Save money on heating and air conditioning with window tinting. Our films reflect the sun's rays in the summer and prevent heat from escaping in the winter, making your home more energy efficient. Raising the energy efficiency of your home may also make also lower your tax bill. The extension of the Energy Policy Act of 2005 provides homeowners who make certain energy-efficient improvements with a federal tax credit. You could receive up to a 30% credit on the costs of qualified window film products, up to a maximum of $1500. Call for more details on how to claim this on your income tax return. Windows are easy points of entry for intruders, and broken glass can pose a serious safety hazard. Our films are specifically designed to hold broken glass in place, lessening the chances of injury and damage to your home. They also make it much more difficult to force entry through windows. Whether your window breaks as the result of a natural disaster or a deliberate act of vandalism, you'll be glad you have our film installed. 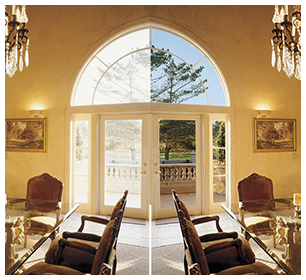 Unfortunately, an improper tint installation can result in bubbled or unattractive window film. We have all the tools and materials necessary for quick and effective film removal. We'll schedule a date to remove the faulty tint and install a new one. At FlexShield we pride ourselves on our installations. Our goal is to get the job done right the first time using materials from quality manufacturers. This approach allows us to offer a 10-year warranty against bubbling. If you notice any bubbling within 10 years of installation, we will return to remove and reinstall your window tint.